Pedestrian Safety Barricades Plastic & Metal - Bulk Pricing! At Start Traffic we are proud to offer modern pedestrian barricades at the best possible prices. Our goal is to offer practical, durable and affordable barricades for any budget. We specialize in modern systems, manufactured with high standards and quality materials. When public safety and security is a factor on a job site or at any public function, deployment of the appropriate system is essential. By using the right system, you can prevent access to restricted areas and ensure the necessary safety and security of everyone involved. 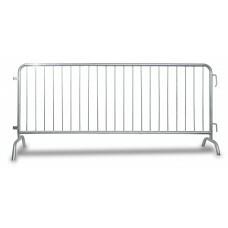 We stock three key types of barriers, construction crowd control and folding. All three types can be used for many different applications. Even though each type of barrier serves different applications they are often used in conjunction with each other. Below are the types of barricade we stock and their key features and functions. Construction barricades need to be simple to deploy, tough, durable and lightweight. The Tough Barrier it is made from blow molded HDPE plastic making them lightweight durable and tough, ticking all the boxes. Our barriers are very stable and can be used in winds up to 20 mph without ballast. They all come standard with a highly reflective strip ensuring that these traffic barriers will be spotted from a safe distance even in low light. Unlike metal barriers, if our HDPE plastic barricades get run over they don’t get destroyed and are still usable. Tuff barriers come standard in orange, our folding and wonder wall barriers come in red. Custom coloring and embossing are available on this barrier. Minimum quantity runs will apply when ordering custom color and or embossing. Our crowd control systems, both metal, and plastic can be used for similar purposes. Personal preference is probably the greatest factor in choosing which is best suited for the application. Barriers made from HDPE are relatively new to the pedestrian barrier market but are proving more and more desirable because of their advantages over metal. Advantages include, there are many colors available, they stack one on the other, they never rust, they can be embossed with company logos and can be run over and still be functional. They are also very easily recycled. Both metal and plastic versions have an interlocking design for pedestrian channeling purposes. Whether separating spectators from races, or events both systems work well and both are easy to deploy and take down. Our metal crowd control barriers are made from modern galvanized steel. They feature interlocking tabs on each barrier, ideal for crowd control at events and functions. These barriers are corrosion resistant and extremely durable. Start Traffic's plastic crowd control barriers are made from UV Stabilised HDPE they have no paint to flake or change color. They pop back into shape after being hit. We are able to supply these in Standard ANSI safety colors, as well as custom colors. Manhole guards are an important item to have and deploy whenever there is the danger of an open hole. Our utility barrier is the perfect product to use when there is a need for caution in a particular work area or whenever someone is working below ground level. It prevents pedestrians from stumbling into holes or manholes. Our folding barricade is a modern leap forward from traditional steel. It features a reflective strip that greatly improves the visibility of the barricade for pedestrians. It is lightweight compact, easy to deploy and easy to transport. When folded It will fit in most any vehicle. These diverse and valuable barricades can be used for just about any application where danger is present and caution is necessary. Why buy barriers from Start Traffic? Your satisfaction is guaranteed or we’ll buy it back. We pride ourselves in awesome customer service. We only sell value and quality. We answer the phone and believe every customer is important. We do whatever it takes to get you the products you need on time and within your budget. We offer bulk pricing and welcome distributors. Most of the products we offer are in stock and available and if they aren’t we will let you know. All of our barricade systems can be fully recycled when they are no longer needed. This includes both metal and plastic products. "From my initial product questions to timely delivery, Start Traffic consistently exceed expectations." Call today to speak to us about our barricade solutions. If you have any questions or need something customized then pick up the phone and speak to one of our sales team, they will happily assist you in finding the right product for your needs. You can also call if you are looking for bulk pricing at (800) 671-9662.